If you're looking for an affordable deal on first class curtain cleaning in Coburg 3058, then look no further! We specialise in returning household curtains to a perfect, as-new condition... effectively ridding you of all manner of dust, dirt and stains. 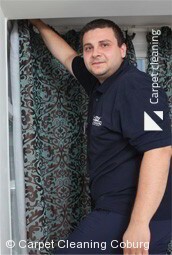 Our curtain cleaners in 3058 are some of the leading specialists in the industry, and all of them come with a full industry training combined with extensive experience in the field. On top of that, our range of state-of-the-art cleaning tools and techniques will allow us to deliver fantastic results on every curtain cleaning job! Book Coburg Curtain Cleaners Now! Give us a call now on 03 8672 2735. Our team of efficient staff are standing by to deal with your enquiry - you'll be able to find out more about our services, book a clean over the phone, or even get a free, no-obligation estimate on curtain cleaning in Coburg! Alternatively, you need only complete our simple online form, to request a quote right this minute... and find out how much we'll be able to save you on a curtain cleaning service in Coburg 3058. "I hired you last week for the first time and I have to say I was pretty amazed by the quality of your work. Thank you for the dedication and the positive..."
"No matter if I have to deal with the mess after a big party or I expect guests or I simply want a bit of cleaning, I always hire you because of the quality...."
"Hiring professional cleaning these days isn't hard but with you it was easier than ever thanks to the 24/7 call centre support."